A Quilter's Table: Triple-Zip Along! 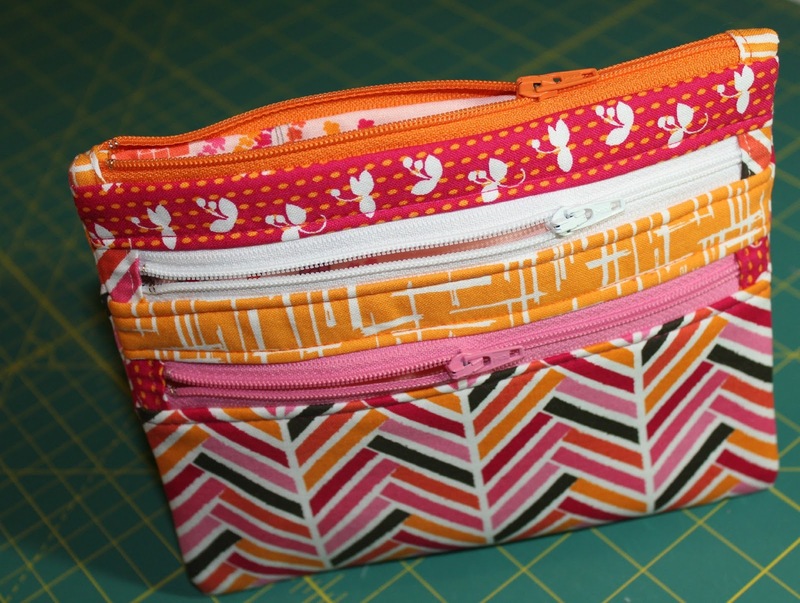 Welcome to the Triple-Zip Along, where we'll all be making our own triple-zip pouches! The sew along officially begins Monday, January 28, and will run through Friday, February 15. During the next two weeks, I'll be sharing the supply list, helpful links, plus answering any questions in the Triple-Zip Along flickr group. So be in touch there for all the most current info and zippy conversation. If you like blog buttons, here's one! And I'd like to thank our kind sponsors! So choose your fabric, gather some zips, invite your friends, and let's get the party rolling over on flickr. See you there! Note that your triple-zip pouches must be shared in the flickr group between the above dates to be eligible for prizes. Yippee!! Looking forward to it! yea! I have been wanting to make zip pouches. This is the motivation that I need! I just joined the Flickr group. I'll be sewing with you! I'm in! I am going to order some zippers tonight. You have lovely sponsors, thank you to them and to you too. This is so fabulous, Debbie! YEY Debbie! I am SO in! I have loved this zippy diddie for so long and it's been on my 'to-do' list since I first discovered YOU...this is just the PUSH I needed...bring on the lists..I'm getting ready! Oh cool, I've been eyeing this pouch ever since you blogged about it! Can't wait to have one myself! I'm in and now off to check out my zipper situation! Ahhh - need to find some yummy fabric!!!! Can't wait!! Joining in. Buttons on my sidebar. Looking forward to this! I just finished the Winter White Exchange...in time to be able to do this. yay, how exciting!!!! getting my supplies ready! Yay! Prizes! I was going to play anyway, but that certainly sweetens the deal and is incentive to finish on time. Alright, more zippers from zipit ordered so I can match if I want! Sounds like fun I'm in! Will be posting another of your 3 zips on Tuesday for a blog hop. this will make 7 of them completed. Your instructions were so clear and easy to follow. I'm so excited for this! Ordered my zippers (and some extras ;) and already set aside the day Feb 2 with a friend to sew, sew, sew! THANKS for the Triple-Zip-Along! What a fun challenge! I think lots of big girls on my Christmas list will be getting these as gifts next December! Oh I have been wanting to make one of these since I saw on on Flickr. Thank you so much! I'm in! Looking forward to making another triple zip! This looks like a great project - never made one of these before so looking forward to it - thanks so much! Totally my kinda project!!! Can't wait to start! So fun! I'll be pulling fabrics this week! I plan to make 6...one for my 4 different SIL and 2 for my son's teachers next year for Christmas! Talk about planning ahead! sweet, im not too late! better gather my zips! yeeaahhhh! i´m happily in !! Oh what fun! I made mine last night, and can't wait to put it in the group on Jan 28 th! I am going to join in as these pouches are just so nice. Hi! Could you possibly help me to understand how this works? I have never joined any 'along' group - and i love to sew, and i am a fabric-a-holic, but i don't see an explaining it page....help? I want to play! i need rules, and guidelines, and oh, just help!! Yay, just the incentive I need to pull that project out of the bin. I'm attempting to resize it so I can fit a magazine in the largest pocket - wish me luck! I want to play also. I have never joined a sew along before. This one seems like fun. Hope to join along, tho I have a bunch of other sewing on my plate. I adore that pouch style and have been wanting to make one! How often do the posts go up? On what day? I just found your blog today...and wish to join the sew along. There's something new to learn! Too cute!! Next time you do this sign me up! I just posted my first one- it was very fun to make- will definitely try to get another done as I think it would make a great valentine's gift for my daughter's teacher!